Yates County is affectionately described by three words: water, wine and wilderness. Located in the center of the Finger Lakes Region, Yates County is surrounded by sparkling waterfronts, touching Canandaigua, Seneca, and Keuka Lake. Keuka Lake is one of the most unique of the finger lakes because of its “Y” shape, making it the only lake in the country to flow both north and south. Nicknamed the Crooked Lake, Keuka’s two north points stretch across Yates County. With that much water, it’s no surprise that summer visits to Yates County include fishing, boating, canoeing and kayaking. Keuka’s shallow waters make it one of the warmer Finger Lakes, and a perfect spot to go swimming. 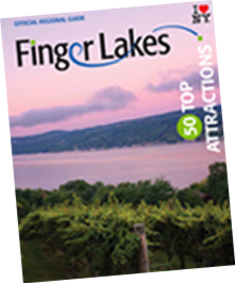 Spend an action-packed day out on the lake or relax along the shoreline with a glass of Finger Lakes wine. Featuring over 5,000 acres of fruitful vineyards, Yate County is the largest grower of wine grapes outside of California and home to over 20 world-class wineries. Travel along the area wine trails, Keuka and Seneca, to savor the enticing flavors amid the beautiful backdrops. And don’t worry beer buffs, Yates County is also pouring some delicious craft brews. Trek through the area’s rolling landscape of wooded trails. The seven-mile Keuka Outlet Trail is open to the public for hiking, biking, horseback riding, snowmobiling and cross-country skiing. It was once ranked one of the best 25 hiking trails in the Northeast. Yates County’s picturesque countryside is dotted with roadside produce stands, quaint country markets and pristine Mennonite farms – perfect for finding that handcrafted good or collectible.